This volume showcases the specially commissioned cover artwork of leading aviation artist Iain Wyllie, who has produced over 30 action-packed paintings for the world’s most successful aviation series of recent years, Aircraft of the Aces. Combat reports by the aces themselves form the basis of the text, along with a brief pilot biography and technical explanation of the aircraft featured in the artwork. Contemporary photographs and a full-color side-view profile complete each chapter, whilst the book’s appendices include a selection of 28 1/72nd scale drawings and a concise tabular listing of the high-scoring aces of World War 2. 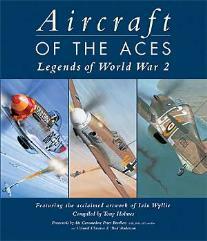 Although derived from the Aircraft of the Aces series, much of the text (over 55,000 words) that accompanies the artworks within this book has been specially sourced for Legends of World War 2, alongside a number of new profile artworks and photographs.